Sparrow T’s is a family business started by Dale Long, who has been in Abilene since 1960. Diane Long, Dale’s wife and partner, has also grown up in Abilene and has been here since 1961. 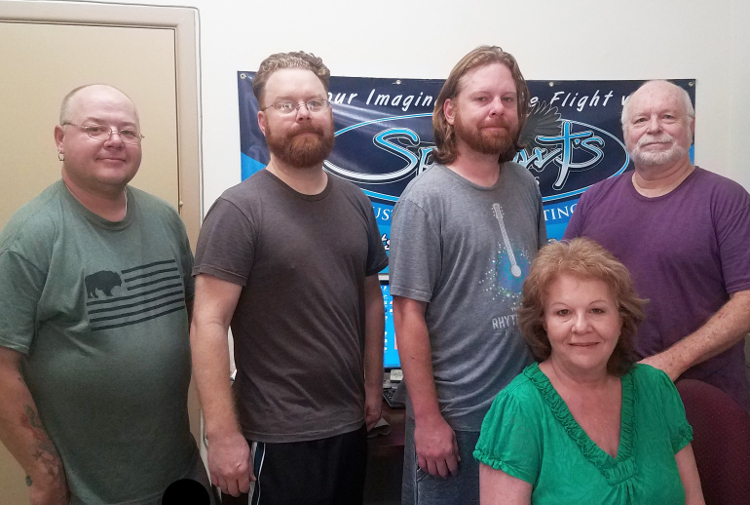 Their sons Byron Long and Evan Long grew up in Abilene and have added their talents to serve Sparrow T’s customers, which include many businesses and events in the Abilene area. Byron studied at Hardin Simmons University and the University of North Texas, majoring in Art and Design. Evan studied at Texas Tech University, majoring in Graphic Design. Dale keeps the daily operations running smoothly and Diane will greet you by phone or in person to help you with your t-shirt needs. Byron and Evan not only design each t-shirt specifically to customers’ needs but also print each shirt, with occasional help from Dad. James Wilkinson has worked with Sparrow T’s for over 3 years, maintaining screens, making sure the machinery maintenance is always done, and folding and checking each shirt that is printed. The Sparrow team has over 50 years of combined experience. (From L to R) James Wilkinson, The Long Family: Byron, Evan, Dale, and Diane (seated). Let the fine artists and artisans at Sparrow T’s help you with your next project! Don’t have an art department or don’t know what you need? No problem, Sparrow T’s specializes in custom logos and artwork designed to your specifications. Take a look in our Sample Room at some of the T-Shirts and other merchandise we have done for folks throughout the Big Country area of Texas.